American Hops first began in the New England colonies soon after the first English settlers arrived there in 1620. These hops were cultivated varieties of English origin, but they were quickly supplemented with wild New World hops as well as with crosses between cultivated English and wild indigenous varieties. There is some speculation that the quintessentially American hop—Cluster—evolved in this fashion. See cluster (hop). As settlement moved west, so did hop farming. By the early 1800s, northwestern New York State had become a major hop-growing region, as had Wisconsin and much of the northern Midwest by the mid-1800s. However, because of the high humidity and cold spring weather in these regions, the hop vines were prone to mildew diseases and aphid infestations, and hop cultivation moved to the drier regions further west. See downy mildew. By the early 1900s the American hop industry was firmly centered in the Pacific Northwest. Northern California was an important hop-producing area in the early 1900s, but commercial production was largely abandoned by the 1980s. Currently, Washington State, Oregon, and Idaho are responsible for almost all American hop production, and the United States is second only to Germany in acres planted. Because of higher average yields, however, the United States often surpasses Germany in pounds produced. Currently, the United States is responsible for 35% to 40% of world hop production. In the second half of the 20th century, several hop breeding programs were instituted in the United States, which led to the development of <?Insert-Figure ID="acref-9780195367133-figureGroup-001006">many new varieties. See ahtanum (hop), amarillo (hop), cascade (hop), chinook (hop), columbus (hop), crystal (hop), eroica (hop), galena (hop), glacier (hop), liberty (hop), mount hood (hop), nugget (hop), palisade (hop), santiam (hop), simcoe (hop), sterling (hop), ultra (hop), vanguard (hop), warrior (hop), and willamette (hop). The Yakima Valley in central Washington is on the dry, eastern side of the Cascade Mountains. It generally accounts for about 75% of all American hop production. See yakima valley hop region. The first recorded hop yard in Yakima Valley was established in 1872, and during the next few decades, the area emerged as a major source of hops. In fact, every hop cultivar grown in the United States today is currently grown in Yakima Valley. But the Yakima Valley’s most important hops, from a commercial point of view, are its high-alpha varieties. The Willamette Valley in Oregon is on the wet, west side of the Cascade Mountains. It is America’s second-most important hop region. See willamette valley hop region. The first hop garden there was established near Eugene in 1869. Today, the center of Oregonian hop production is farther north, between the cities of Portland and Salem. Nowadays, the Willamette Valley usually accounts for about 10% of American hop production, whereas in earlier times, Oregon outproduced Washington. Although the Yakima Valley gives precedence to high-alpha bittering hops, the Willamette Valley concentrates on aroma hops. High-alpha hop varieties tend to be particularly sensitive to mildew diseases and thus do not do well in Willamette’s wet spring weather; the exceptions are Nugget and Newport, which are mildew tolerant. 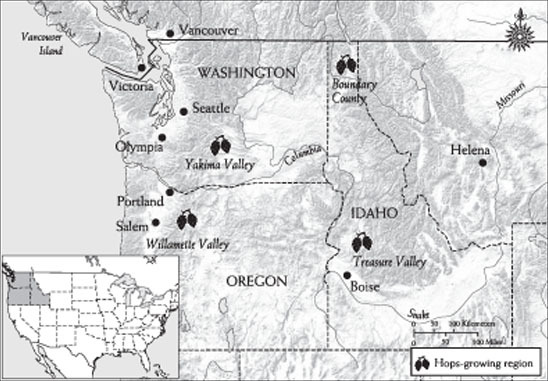 Current hop production in Idaho is centered near the town of Caldwell, slightly west of Boise. Relatively small amounts are also grown in northern Idaho near the Canadian border. Hop farming in the Caldwell area did not start until the mid-1940s. The climate is hot and dry, similar to that of the Yakima Valley, which is why this area, too, specializes in high-alpha hops. Only about 8% of all American hops are grown in Idaho. See also idaho (northern hop region) and idaho (southern hop region).